In the largest field trial of its kind in the United States, researchers have determined that the giant perennial grass Miscanthus x giganteus outperforms current biofuels sources – by a lot. Using Miscanthus as a feedstock for ethanol production in the U.S. could significantly reduce the acreage dedicated to biofuels while meeting government biofuels production goals, the researchers report. The new findings, from researchers at the University of Illinois, appear this month in the journal Global Change Biology. "What we've found with Miscanthus is that the amount of biomass generated each year would allow us to produce about 2 1/2 times the amount of ethanol we can produce per acre of corn," said crop sciences professor Stephen P. Long, who led the study. Long is the deputy director of the BP-sponsored Energy Biosciences Institute, a multi-year, multi-institutional initiative aimed at finding low-carbon or carbon-neutral alternatives to petroleum-based fuels. Long is an affiliate of the U. of I. 's Institute for Genomic Biology. He also is the editor of Global Change Biology. In trials across Illinois, switchgrass, a perennial grass which, like Miscanthus, requires fewer chemical and mechanical inputs than corn, produced only about as much ethanol feedstock per acre as corn, Long said. "It wasn't that we didn't know how to grow switchgrass because the yields we obtained were actually equal to the best yields that had been obtained elsewhere with switchgrass," he said. Corn yields in Illinois are also among the best in the nation. "One reason why Miscanthus yields more biomass than corn is that it produces green leaves about six weeks earlier in the growing season," Long said. 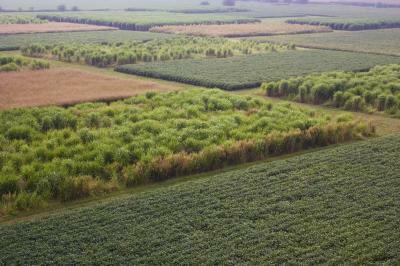 Miscanthus also stays green until late October in Illinois, while corn leaves wither at the end of August, he said. The growing season for switchgrass is comparable to that of Miscanthus, but it is not nearly as efficient at converting sunlight to biomass as Miscanthus, Frank Dohleman, a graduate student and co-author on the study, found. "One of the criticisms of using any biomass as a biofuel source is it has been claimed that plants are not very efficient – about 0.1 percent efficiency of conversion of sunlight into biomass," Long said. "What we show here is on average Miscanthus is in fact about 1 percent efficient, so about 1 percent of sunlight ends up as biomass." "Keep in mind that when we consider our energy use, a few hours of solar energy falling on the earth are equal to all the energy that people use over a whole year, so you don't really need that high an efficiency to be able to capture that in plant material and make use of it as a biofuel source," he said. Field trials also showed that Miscanthus is tolerant of poor soil quality, Long said. "Our highest productivity is actually occurring in the south, on the poorest soils in the state," he said. "So that also shows us that this type of crop may be very good for marginal land or land that is not even being used for crop production." Because Miscanthus is a perennial grass, it also accumulates much more carbon in the soil than an annual crop such as corn or soybeans, Long said. "In the context of global change, that's important because it means that by producing a biofuel on that land you're taking carbon out of the atmosphere and putting it into the soil." Researchers at Illinois are exploring all aspects of biofuels production, from the development of feedstocks such as Miscanthus, to planting, harvest, storage, transport, conversion to biofuels and carbon sequestration. 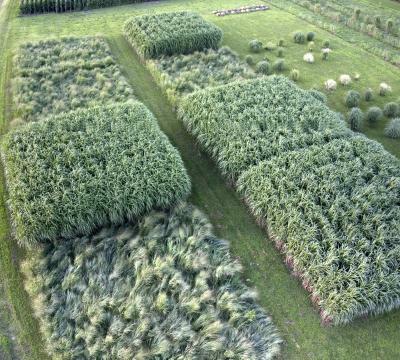 Using Miscanthus in an agricultural setting has not been without its challenges, Long said. Because it is a sterile hybrid, it must be propagated by planting underground stems, called rhizomes. This was initially a laborious process, Long said, but mechanization allows the team to plant about 15 acres a day. In Europe, where Miscanthus has been grown for more than a decade, patented farm equipment can plant about 50 acres of Miscanthus rhizomes a day, he said. Once established, Miscanthus returns annually without need for replanting. If harvested in December or January, after nutrients have returned to the soil, it requires little fertilizer. This sterile form of Miscanthus has not been found to be invasive in Europe or the U.S., Long said. There are at least a dozen companies building or operating plants in the U.S. to produce ethanol from lignocellulosic feedstocks, the non-edible parts of plants, and companies are propagating Miscanthus rhizomes for commercial sale, Long said. Although research has led to improvements in productivity and growers are poised to begin using it as a biofuels crop on a large scale, Miscanthus is in its infancy as an agricultural product, Long said. 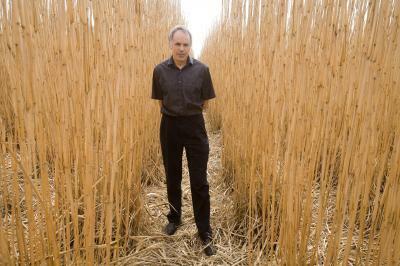 "Keep in mind that this Miscanthus is completely unimproved, so if we were to do the sorts of things that we've managed to do with corn, where we've increased its yield threefold over the last 50 years, then it's not unreal to think that we could use even less than 10 percent of the available agricultural land," Long said. "And if you can actually grow it on non-cropland that would be even better."